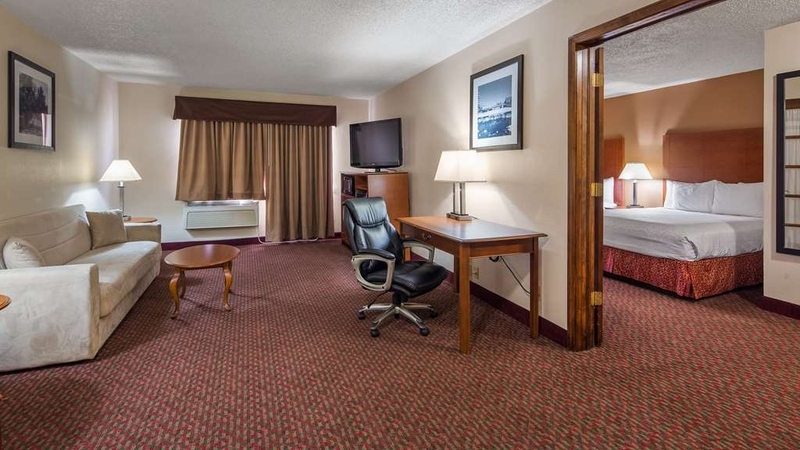 The Best Western Inn of St. Charles is ideally located in the center of Saint Charles. Come and experience our hotel near the major tourist attractions. Best price guaranteed and exclusive deals. We pride ourselves on being one of the finest hotels in St. Charles. Our hotel is perfect place for a romantic getaway, family outing, or to simply rest your head. 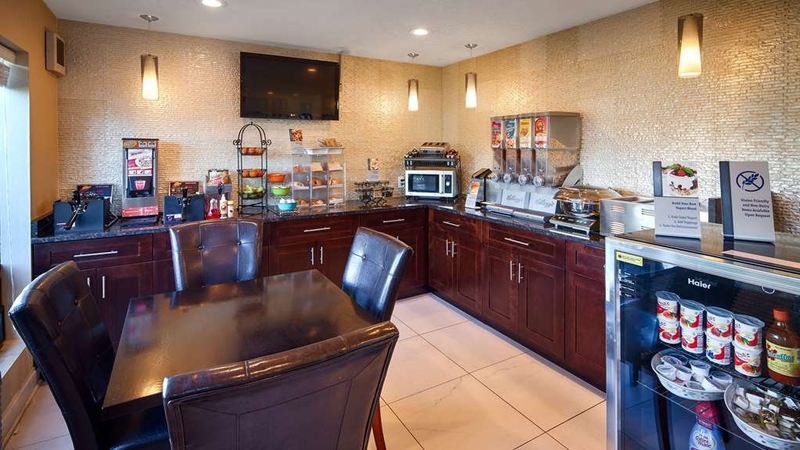 Our standard king offers the comforts of home with a few added amenities that will make your stay extra special. Pull back the covers, hop in and catch your favorite TV show in our standard king. Stretch out and relax in the standard two queen guest room. Your comfort is our first priority. In our two queen standard guest room, you will find that and much more. 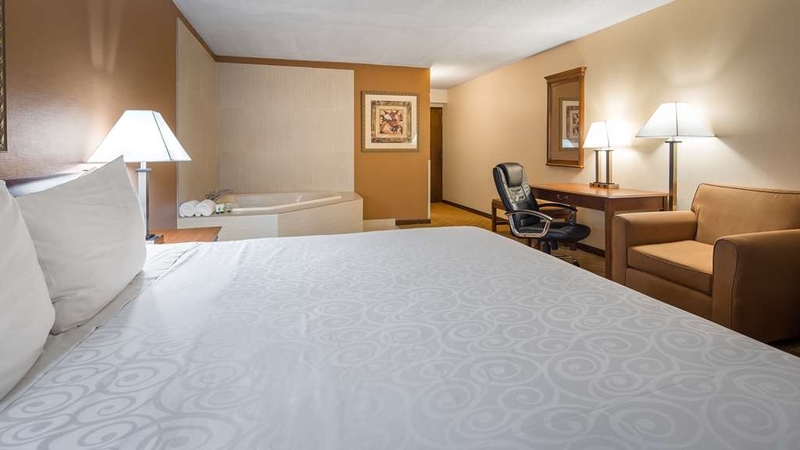 Book our business class king guest room so you can stretch out and relax! Indulge yourself in our warm, welcoming and inviting business class two queen guest room. At the end of a long day, relax in our clean, fresh business class two queen guest room. 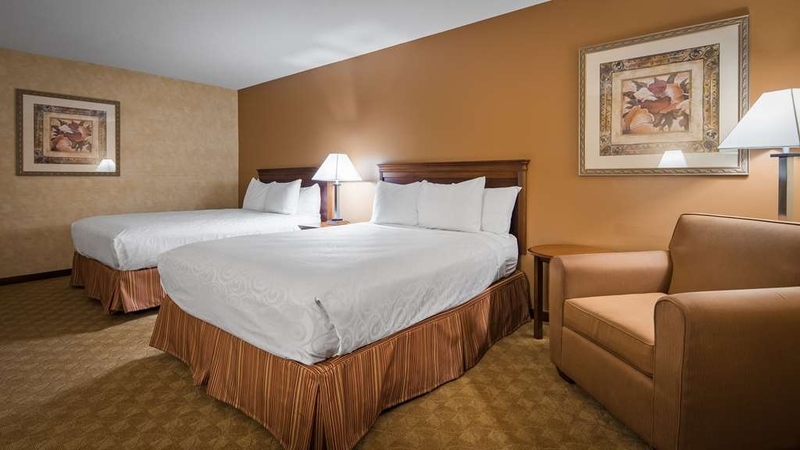 Our two queen guest room was designed with an open concept, ensuring you have enough room without sacrificing comfort. Upgrade yourself to our two queen suite for added comfort during your stay. Use the separate living room in our two queen suite for entertaining, and keep your sleeping area private. Live in true luxury when you book a two queen suite. 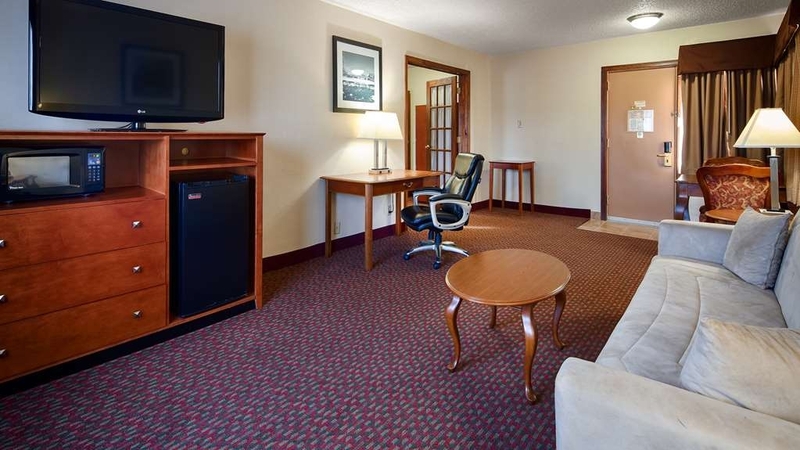 Our two queen suite is perfect for family, group of friends, extended stay, or weekend getaway. Are you seeking pure, complete and total relaxation? 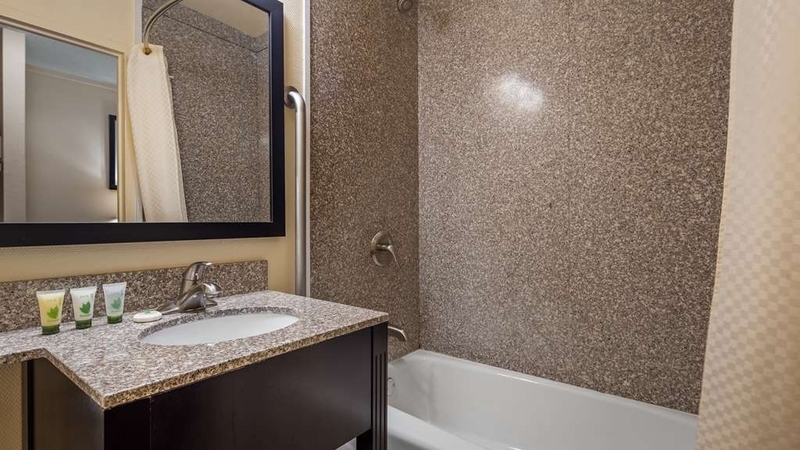 Then make a reservation in our whirlpool king suite. 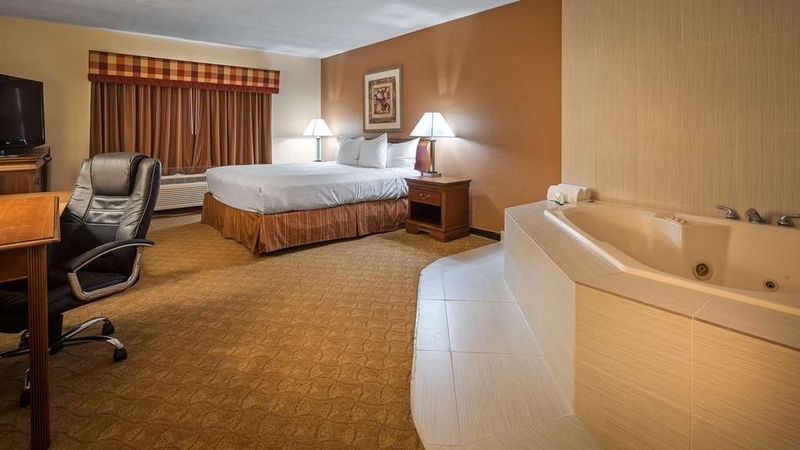 If you’re looking for a little extra space to stretch out and relax, book one of our whirlpool king suite. Relax the body, mind, and soul in our whirlpool suite. 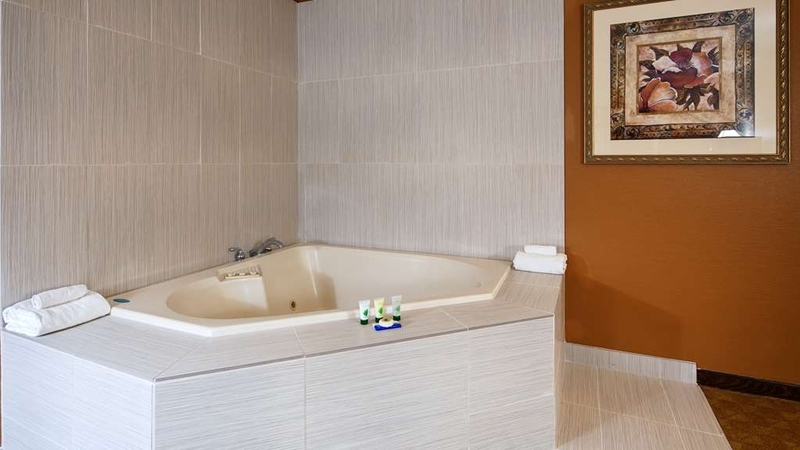 Soothe your tired muscles in our whirlpool suite. 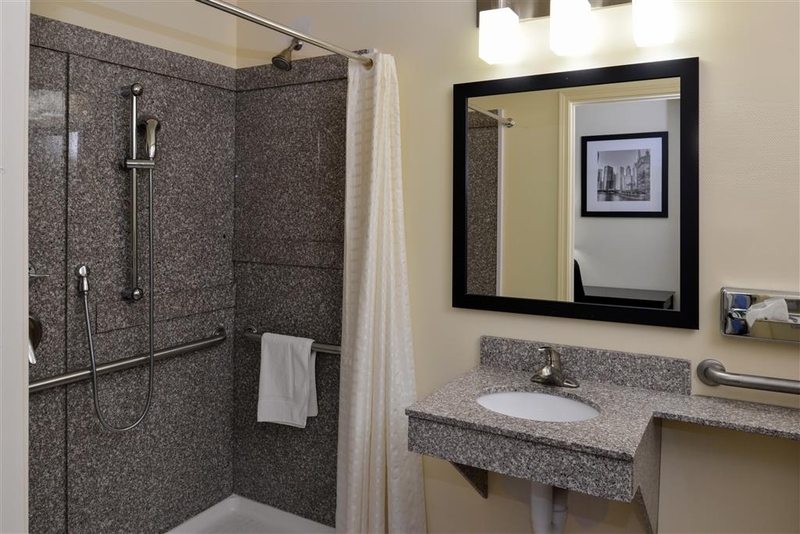 Our mobility accessible bathroom offers a roll-in shower to accommodate your needs. 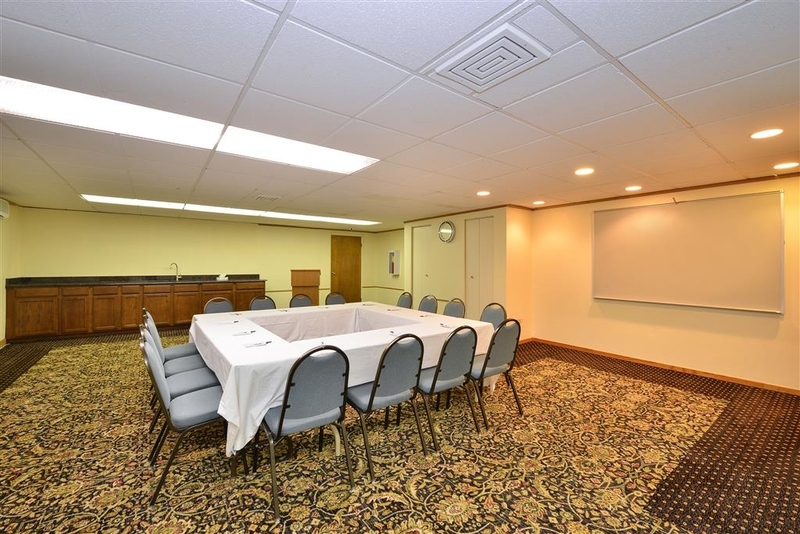 Enough space to cater your next meeting, presentation, seminar or trade show. 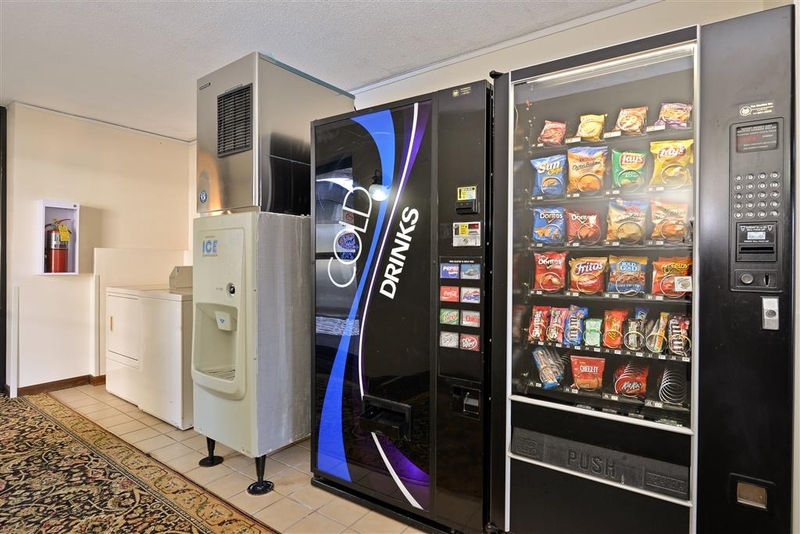 Grab a cold drink or snack before kicking back in your room. Explore historic downtown St. Charles. Shop to your heart's content at the Kane County Flea Market, Geneva Commons, and Aurora Chicago Premium Outlets. Press your luck at Hollywood Casino in Aurora and Grand Victoria Casino in Elgin. Explore the Kane County Fairgrounds, Funway Entertainment Center and Pottawatomie Park. Attend special events, like the bi-annual Toy Show, Jukebox Show, annual Scarecrow Festival and more - all very popular with locals. 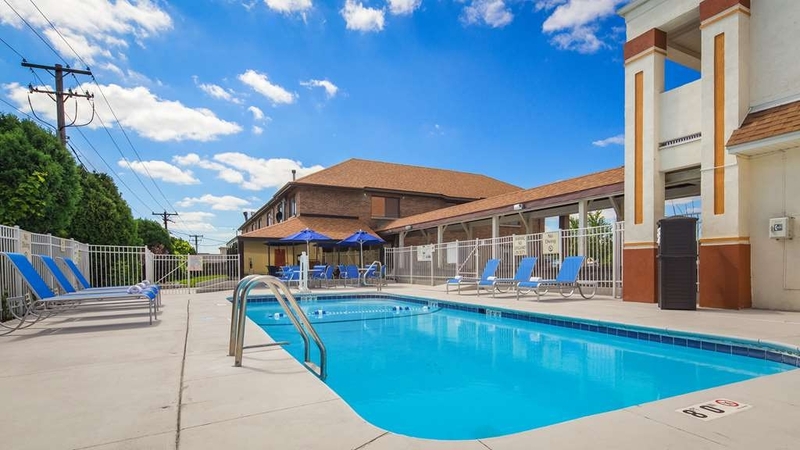 Your St. Charles vacation experience is customizable to your interests when you stay at the Best Western Inn of St. Charles. 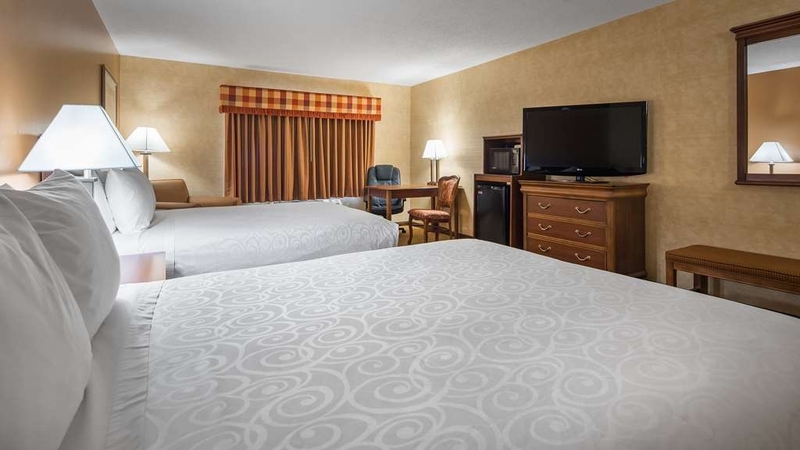 After a full day out on the town, head back to this St. Charles Best Western for rest and relaxation. 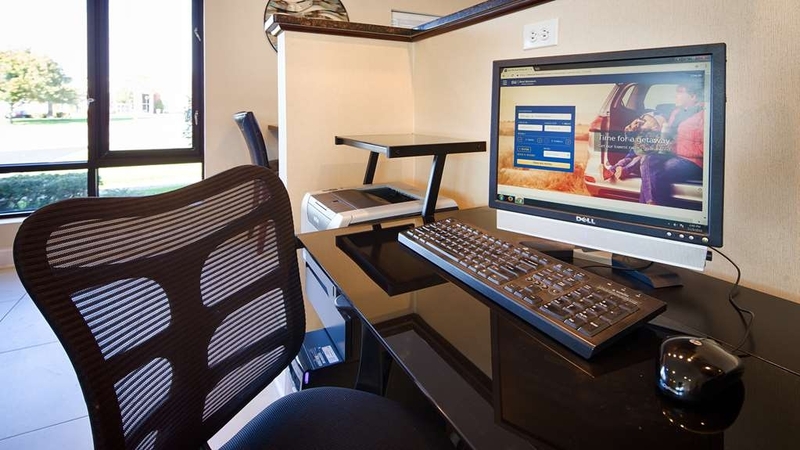 Each comfortable guest accommodation here offers complimentary high-speed internet access, cable television with HBO®, a microwave, refrigerator and all the comforts of home. 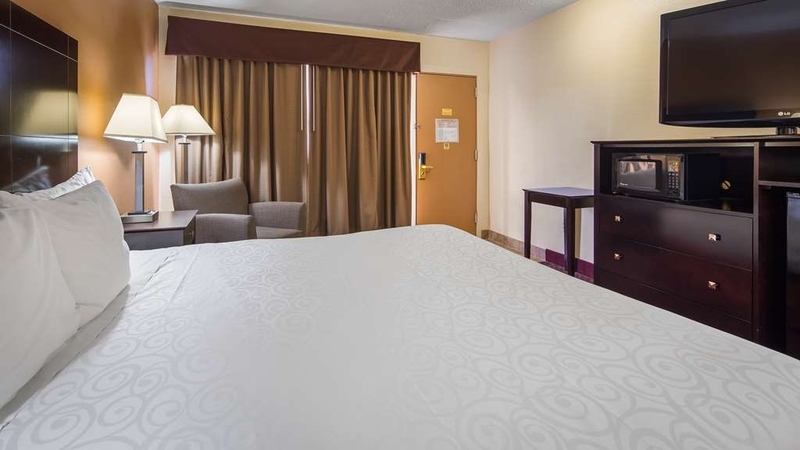 Whirlpool rooms are also available upon request. 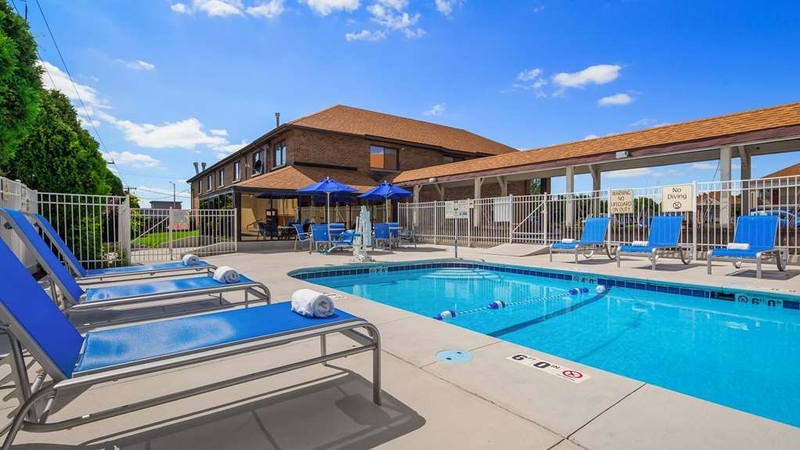 Other amenities at this St. Charles hotel include complimentary full hot breakfast with free newspaper each morning, plus a fitness center and newly renovated outdoor heated pool open seasonally. Please note there are no elevators at this hotel, so please request a downstairs room, if needed. 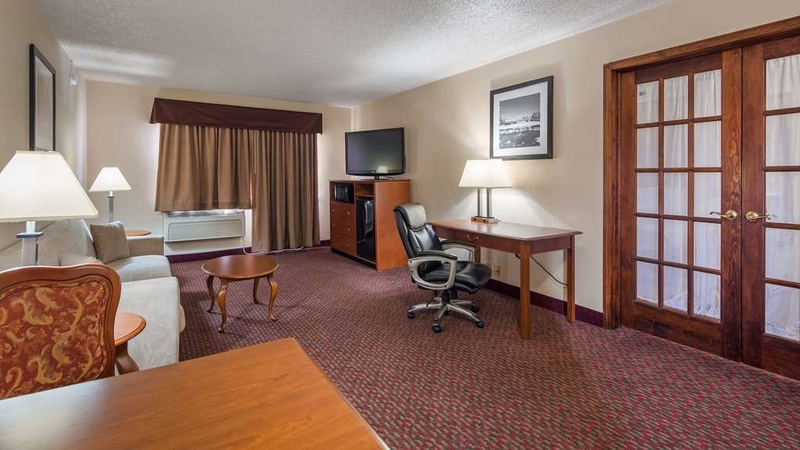 Staying at this St. Charles Best Western on business? 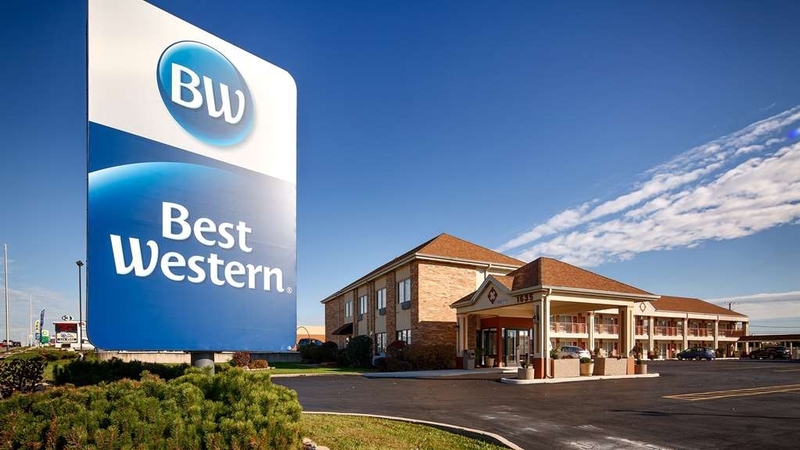 The Best Western Inn of St. Charles offers a great location near area businesses, including Pheasant Run Resort, DuPage Expo, DuPage Airport, Kane County Fairgrounds, Fox Valley Ice Arena (Chicago Steel hockey), Northwestern Medicine Field (Kane County Cougars Baseball) and the Q-Center. This St. Charles hotel is also perfect for wedding, groups, reunions and more. For group bookings with prearranged contracts, shuttle service is available. 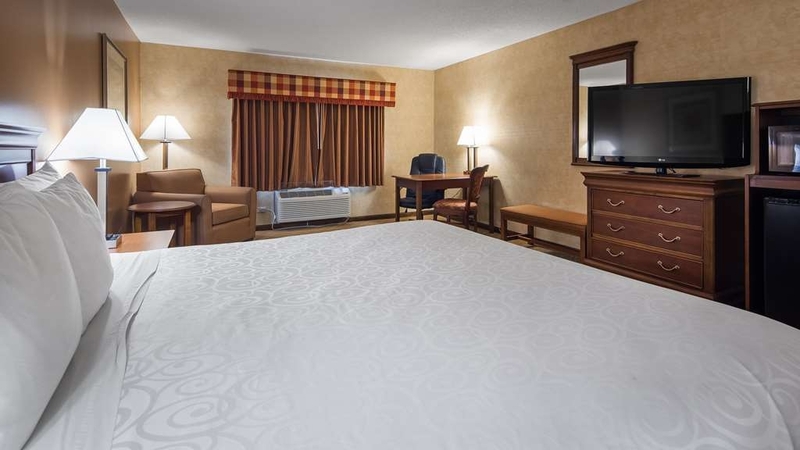 Don't delay - book your Best Western Inn of St. Charles stay today and save! Our friendly and helpful staff is here to make your next visit unforgettable. This hotel was clean, safe, and convenient to where we needed to be. If we were to visit St. Charles again, I would definitely stay at this Best Western. The free upgrade upon check in was an added bonus! I've read some of the reviews and totally believe that this could be an ideal place to stay. But, the service I received at the front desk from a Mr. Patel is less than acceptable. No greeting, just a blank stare. He tossed my credit card on the counter, than tossed my room key on the counter. He was really mean. I should have instantly left, but I am here on business and my company paid for it. How do places like this stay open? Checked into the hotel since we have stay here several times before. The room was very cold and the room temperature would not get above 70 degrees if that. Looking at the door you could see daylight and with the weather all the cold air was getting inside. The sheets were thin as paper so even at night it was very cold. Breakfast was food! Bacon was very greasy and the cereal was not as marked. Milk is served in gallon containers instead of single serve containers. This is great at home but not a hotel. I have stayed here several times before and that is why I returned. Hopefully the hotel can make some changes to bring the hotel back to what it used to be. "Clean Comfortable Reasonably Priced Room with Comfortable beds "
The rooms were clean but they were very musty smelling. Wouldn't recommend this hotel. I have been sick since staying there. They did have a breakfast that was adequate. The hotel people were ok. The shower had no plastic liner on the curtain which the curtain got wet when taking a shower. "Exceptional customer service at a great price!" The Best Western of St. Charles was such a pleasant surprise! 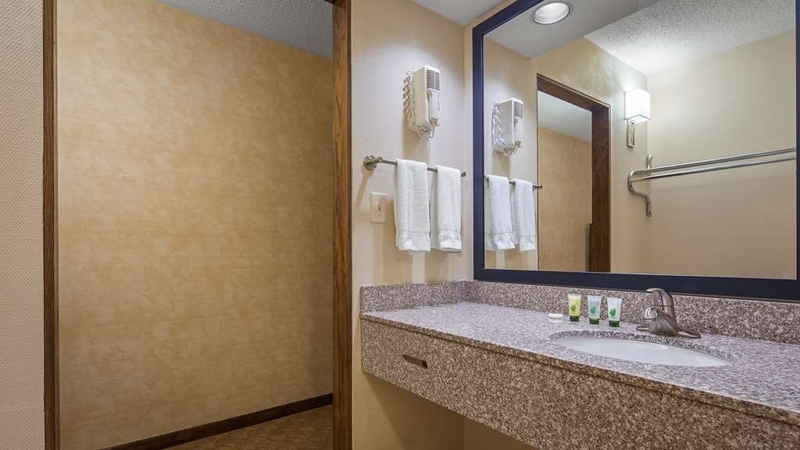 The room was comfortable and very clean, nice amenities, affordable, and perfect for two. They even had cofee and Juices available throughout the day and night. Also, this is a perfect hotel for the business trip folks as they offer high-speed internet for free and excellent conference rooms. Their parking lots are even larger, typically occupying a land area three times the size of the hotel itself. Would definitely stay again and I highly recommend anyone to stay here! Room was clean. Located centrally. Decent price. Friendly staff. Giving a 4 because the room has been used by smokers and it hasn't been sanitized to remove smoke odor. One of the few hotels I have stayed in that the water pressure was good and drains flowed well. "Hotel nice, Manager not so much"
The room we had was very nice, the breakfast was good. The manager called on the day of our arrival and was rude telling me the card I had reserved the room with was declined. I explained that I was told that nothing would be charged until I arrived. He was very rude and told me that what his employee of 3 years said means nothing. He also said that if I did not show up by 6pm he would give my room away. The total was suppose to be 160 dollars but we were charged 185. We were in town for the Chicago Toy Show. I made sure to tell the group about this person. I have never been treated so rudely, I have been a hotel manager for over 10 years and would never treat a customer this way. One more thing, when I came down to check out on Sunday morning, he seen me and walked away from the desk and had his breakfast person talk to me. He also treated the person in front of me at check in very badly, he lost the persons reservation and was very rude to him. He was in town for a funeral. Very sad! Make this property your last option! I paid to stay in the Executive Building and it turned out to be a 2 floor, unlocked building with no security features. The lock and door handle on my individual room was so loose, I thought it was going to fall off. I stood in 4 inches of water to take a shower, the toilet backed up 3 times and the bed was soft and lumpy. DON'T STAY HERE!! We asked for a non smoking room, when we arrived at the hotel, the unpleasant and rude Manager Arpit Patel, gave us a room that smelled like smoke. When we asked for a different room, he didn't appear to believe us and asked us to pay a higher price to move to a different room. When I asked him for a manager he claimed to be the manager of all the best westerns and refused to give us a name to a person above him. He made a rude comment saying that the price difference was not going to kill us. Beware the rooms smell of cheap alcohol and liquor. The room was basic, seemed to be clean but in serious need of updating. Bathroom was about the size of our 1/2 bath at home. Carpeting needed to be thoroughly cleaned. Staff were polite but not exactly what you would call friendly. It wasn't horrible, but we were quickly reminded that you GET what you PAY for. Will not stay here again, I don't care what it costs somewhere else. Not what I expected at a Best Western motel. The overall quality of my stay was disappointing. It sstarted with an attendant who had no idea as to how to handle my gift cards. My TV remote was broken and not replaced. In flushing the toilet I noticed water oozing from under it. The security "peep" hole had toilet paper stuffed in it. Need I say anything else? Just far below the quality of the dozens of other BW properties I have stayed at. We stayed here for my daughter's wedding at Riverside Receptions. The location was perfect being right down the street and the room was huge! It was the Executive Building which apparently has bigger rooms. The bathroom was very good also for getting ready for the wedding with plenty of mirrors. Good size mini frig also. Very clean and very easy access to downtown St. Charles and Geneva. My family and I stayed here for 3 nights while I worked in Geneva during the day. Our room was clean, the breakfast was good (fresh fruit available) and we didn't have any problem with noise. We were a little leery when we pulled up because it's an older hotel with a strange layout but it was perfect for our needs. This hotel clearly needs to be updated; but it was clean. However DON'T leave anything of value in your room when you are away as it will disappear. The only item of value; other than my laptop; was a piece of bracelet that I meticulously look after. Coincidentally; it was the only item that went missing; easy to pocket and easy to pass of as the patrons fault. The management will do nothing to even acknowledge it. Outdoor pool is cold and they lock the gate sooner than the posted closing time. Breakfast was edible; but nothing great. Parking also is extremely limited. Stay out past 10p and you will be parking somewhere else. "Perfect stay so close to everything." We needed a hotel near Elgin but wanted a hotel near Genva (super cute town) This hotel had everything we needed close to Girodonio pizza and Target. The pool was nice. Room was clean and beds were confy. We didn't have their breakfast but enjoyed the coffee. 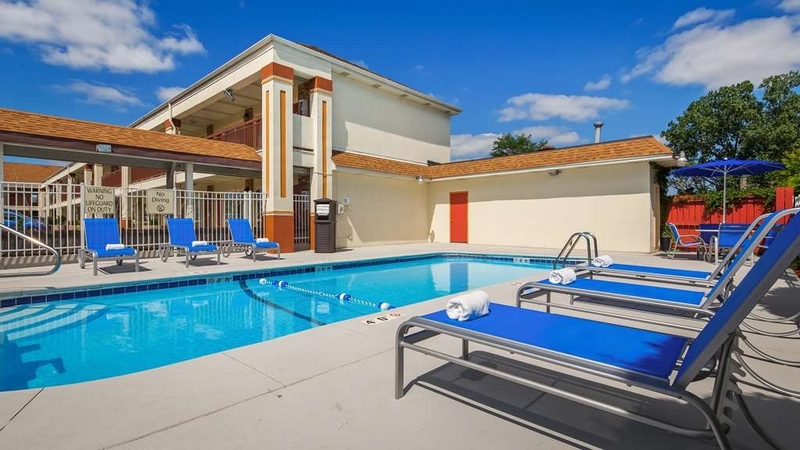 "Dated hotel, nice outdoor pool, older but nice fitness center." This hotel definitely could use some updates, lock chains on the hotel rooms are one, but the motel was clean and loved the easy access to the parking lot. The outdoor pool was large and clean, the fitness center faces the pool so it offered nice views while working out. The front desk staff definitely could use some training, did not thank us for being Diamond Rewards members nor did they offer us our free welcome gift. The lobby is separated from the rest of feb hotel, you have to walk outside to go to breakfast which may offer an inconvenience during the colder months. The breakfast was ok. Not the best Best Western we have stayed at, but reasonably priced and we had a comfortable night stay. Where to begin? Hotel staff is incredibly rude. No security means people sitting outside on lawn chairs until all hours drinking and playing music. My husband asked housekeeping to come back in 10 minutes when we would be gone, to which the owner (who follows the maid around) yelled "No! You take housekeeping now or you don't get it. We not coming back!!!" Breakfast area is cramped and owner will literally stand over you at 10 am demanding you leave because "breakfast is over." We were with a very large group for a skating competition--pretty much sold out most of the rooms, yet we were thrown out of the basement (where there's a dark, dingy "conference room") and ordered to pay $700 to use it for 1/2 an hour. Several things went missing from our room. Also be very cautious at the pool area -- pool service said its wires are duct-taped together clearly in violation of whoever inspects this thing. Also three stone-cold sober members of our group fell at the pool because of a hazardous ramp area that's not marked. We'd literally see someone with bruises and sat "you fell at the pool too?" Stay away. It's horrible. "Where customer service is job zero"
Based on Trip Advisor reviews from three months ago, I made reservations for a one night stay. Upon arrival and informing the guy at the counter that I had reservations, his first words were "credit card". No welcome, or can I help you. His next directive was to sign his invoice. No further conversation on his part. Once at the room, we found that the toilet had been used, not flushed, and obviously not cleaned. Strike three came the next morning upon checkout, when a different guy was behind the counter. He was on the phone, and couldn't be bothered to end his conversation, to check me out, (and no it wasn't a business conversation). Really if they don't value their customers, there are plenty of other options, in the St. Charles area. Well. Shower broken, hot and sticky and direct view on the car park along the street . It is not worth the money. Breakfast area is not relaxing and overall quality very disappointing... it is convenient for a quick night ( late arrival early departure) that's all ! There are much better alternatives in the area! Worst experience. Staff is rude and nasty and not helpful. The front desk clerk threatened me and would not help. They had the wrong name on my reservation even though they had my credit card right name and charged that so fast isnt funny. I had the reservation number but they wouldn't give me the room because they put the wrong name on it and I has talked manager multiple times. An older style motel with adequate parking. Located with a restaurant in the shared parking lot. Difficult to navigate into traffic. Beds are comfortable and housekeeping is attentive to your needs. The breakfast area is a bit crowded but ofo good quality. This hotel is clean. The problem we had was every day the cleaning crew would come into the building and start yelling (or talking very loud) for the whole time that they were in the building. Didn't seem to care if anyone was in their rooms trying to take a nap or read a book. They would even try and talk over the other person running a vacuum. Way too noisy for us. A clean, quiet warm place to stay on business or leisure. i would recommend this to any one traveling to the St Charles Illinois area. 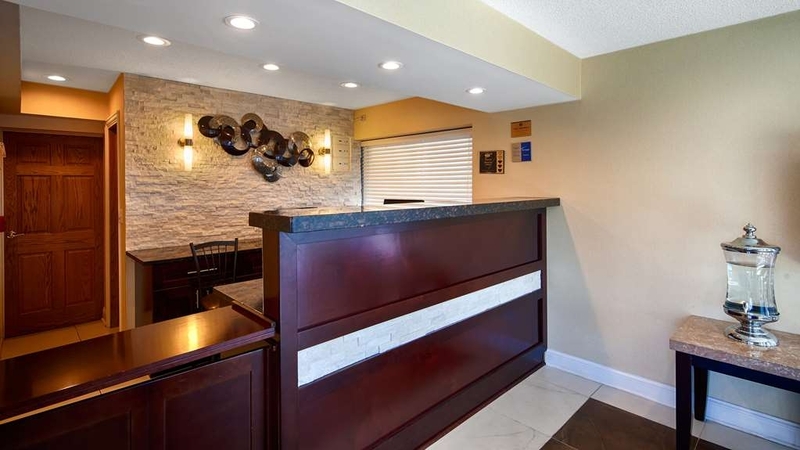 convenient parking and within short walking distance to many quality restaurants. 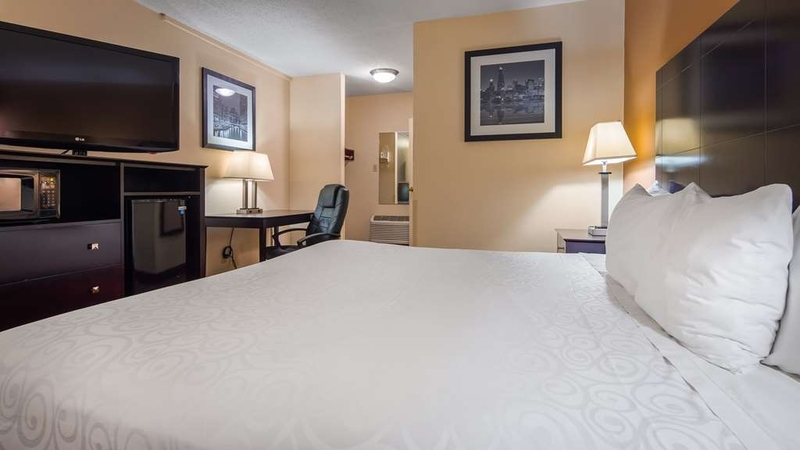 This hotel is conveniently located on main access through St. Charles, close to downtown, right next to fabulous Colonial Cafe (ice cream & full meal menu). Hotel room was clean, modern, attractive, and spacious. Staff were all pleasant and helpful. Room rate with full hot breakfast included was very affordable. This hotel is the most strangest I've ever been too. they clean in the middle of the night (vacuum). One of the staff was being a stalker starring at my co workers from the window for over 20 min. (i even took a picture, but should of took a video) management didn't care about any of this. And to top it off i was showering and one of the house keeper (i never called) came inside and was just standing in the room and as soon as i walked out he panic and ran out the room without saying one word. Management laughed at the story. Everything was excellant .We found it to be in a very convenient location easy to find easy parking.The employee wa s very helpful and next to a restaurant.Sorry i cant say anymore The price was great we didnt half to drive all around. Nice clean and updated facility with excellent customer service. The cost/amenities were a great value. Payed about $100 for a King Suite w whirlpool. The breakfast was good, and parti ularly the coffee compared to other hotels. My girlfriends and I brought our adult daughters here for a weekend. We went to the Arcada Theatre and then dinner in Geneva. The Kane County flea market. The final day shopping in Geneva...this hotel was so reasonable and easy access to everything. "One of the Best place I stayed"
"nicely run hotel and very clean comfortable rooms"
This is a well run hotel and the staff make every effort to meet the needs of their customers. 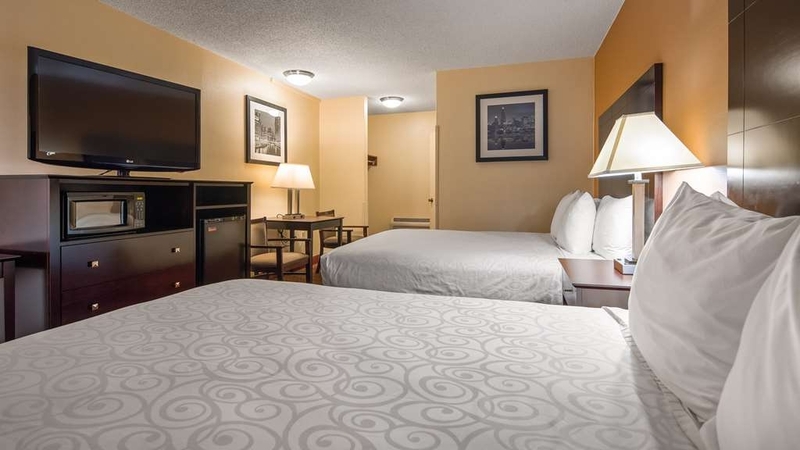 We highly recommend this hotel to anyone needing a hotel in the St Charles, Illinois area. The rooms are comfortable and clean and the breakfast is very good with a lot of choices. the fitness center has a choice of exercise machines in it. Nice hotel..
TV needs adjustment. It showed people as being FAT. Staff needs to clean room earlier in day. They arrived to clean/service room at 4 PM. Our day was over at that time, so we sent them away. Otherwise the room was always very clean. "Very nice and economical place to stay"
I spent 2 nights here recently while attending a wedding and was very happy with the location, the facilities, and the hotel staff. I was given a free upgrade, the free breakfast include a very nice variety of options, and the hotel staff was able to help me get my smart phone connected to their free WiFi. The beds were very comfortable, and the heating/AC system had the continuous fan option that I like. Older facility but very clean...convenient location...nice fee breakfast...fair price...we will be back when in the area. Be sure to check out St Charles and Geneva IL...nice towns..lots to see...Kane County is a great area...lots of family fun! "The Best Place To Stay in St. Charles,IL." Amazing place to relax and enjoy when away from home. I enjoy it from check in to check out.Everyone is attentive and warm in every way to make our stay a happy experience.Thank you all for showing the professionalism that makes your Hotel the place to stay !!!! Very nice clean comfortable place. Close to restaurants of different tastes and styles. Located in between downtown St Charles and the eastern boarder. Commercial airport east about 3 miles. works well for business or family travel. Hotel was very clean, very comfortable and close to where we wanted to go. Breakfast was excellent. Will consider this hotel anytime we are in the area. Older hotel but everything was nicely remodeled. Perfect location. Rude and thoughtless manager, Promised to transport group of guests for a wedding in a bus. Ended up beingone beat up van that could not take us all in one trip. By the time it would have came back to pick up the rest the wedding would have been over. Do not trust management. 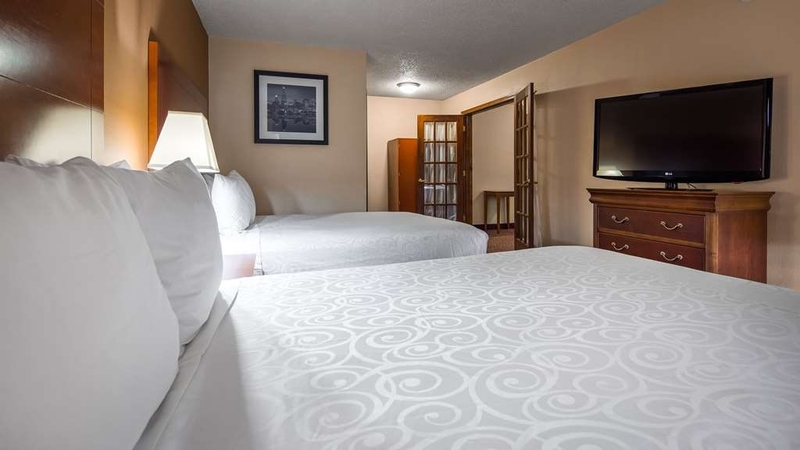 This modest, comparatively inexpensive Best Western is located east of central St. Charles on Route 64, well removed from the quaint elegance and ambience the Fox Cities are famous for. But what makes up for this is that it is adjacent to the Colonial Cafe, an historically renowned local diner famous for its homemade ice creams, as well as superb breakfasts, and good lunches and dinners. The rooms at the BW are clean, well kept, and comfortable, though the overall structure is somewhat plain and outdated. The South Indian family that maintains the BW are hard working and dedicated. The breakfasts at the BW need improvement. The grey breakfast sausages, for instance,seem to have been heated up in a microwave. The breads are not appealing. But why would anyone want breakfast at the BW, when a world class breakfast is inviting you from the Colonial Cafe next door? We come to Chicago area several times a year and we stay here as it is central to areas we want to visit. We enjoy eating at the Colonial Cafe next door as the food is real comfort food. We sleep better here thab at home as the mattress is the best for our backs. The staff, facilities, and service was outstanding. 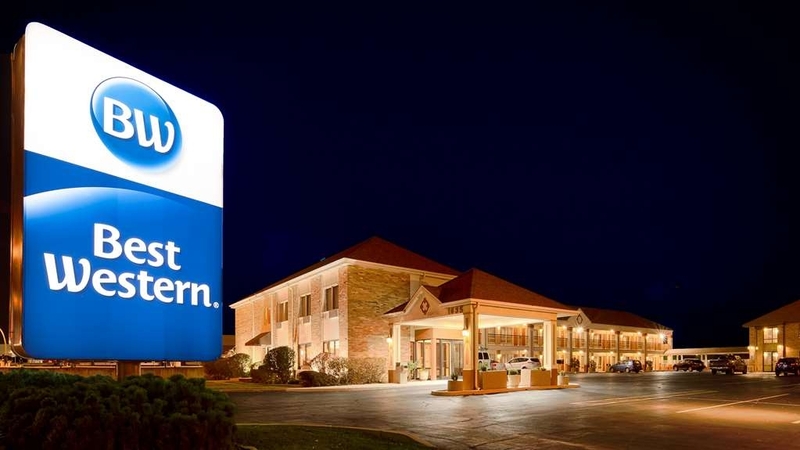 I plan on returning to this Best Western when traveling to the St. Charles, IL area. The room decor was calming. The room and hallway was very clean. Great place! We stayed in a King interior room. It was very clean and roomy. The staff was very welcoming. We did not use the pool or weight room but we did see that both areas were clean and orderly and that other customers were enjoying the facilities. We did not try the free breakfast that was available. We come to the area often and will return to this property. received a call from the hotel in middle of the afternoon on our day of arrival. Hotel staff was asking if we were still coming??? It was 2:00pm. I explained that yes we were still coming and thats why we reserved rooms. We were travelling on motorcycles and check in would be late. Said they had to charge my card on file. I explained that I reserved rooms and others in group would cover their rooms upon check in. Charges were done on my card on arrival and staff said couldn't reverse. "Nice in new building not so in old motel part"
Last year we stayed in newer 2 story building this year in older motel side. Interior has been redone somewhat but still strong Oder of smoke unless you keep air cool and running full time. Blankets on bed need to be replaced. Old cheap pulled blue blankets. Great location but for price they need to overhaul the old building. There were six of us women who stayed in a suite with a turn down couch. The suite was updated and clean. That couch was meant only for one and was not comfortable at all. They have a nice variety for their continental breakfast, but none of it tasted good except for the English muffin I had. The pool is small and there were no bathrooms by the pool or workout room. But what really upset me is that they charged my debit card the day before we made the reservations for. I did not have enough in my account to cover the fees and so my account was over-drawn. Everyone was pitching in for the room, I would have had the money at check out, like we have done at every other hotel we've stayed at over the last 18 years-including other Best Westerns. The girl behind the desk said they do that when they are fully booked. How was I to know they were booked? I spoke with the manager who was curt and said he is not going to play those games. What games? I'm the one whose card was unexpectedly charged. He would not return the money charged to me, he would not even look at the proof I had that the over draft caused by BW. The suite was decent. The staff was nice, but the manager was a jerk. I don't like their policy of charging my card because they are full. I can understand if I didn't show up without calling to cancel, but not charging my card the day before I am set to arrive. Not a bad place, but there are better. I checked in at 12:45pm and had reservations. There was a non-american who barely spoke english and gave me a room and said my room just got ready. The room smelled terribly of cigarette smoke, and was a handicapped room. The shower leaked and they had towel lining the outside of the shower. The internet code wasnt given to me, and I had to call back for it. When I checked out, I told them about the issues. Nothing was said to me about it or any appologies. Very upset and disappointed. Highly recommend this hotel. Very helpful pleasant staff. Spotless clean rooms and very quiet A/c. The location was very convenient. The Colonial Inn next door served reasonable and excellent food with a diversified menu. As an older hotel, we thought it was well kept. It looked like a family owned operation. They worked well as a team to make our stay comfortable. Our aim was to go to Geneva for my husband's Birthday dinner. Eat big and sleep cheap. Met our expectations. Our visit started on the right foot. We arrived earlier than expected,and were given our room keys, but told to wait an hour or so for the room to be cleaned. No problem....Our room ended up not being cleaned until the actual check-in time. Again, no problem. Initially, room was adequate. We quickly readied for the wedding we were in town for, and left. Later that night, when turning the bed down, I discovered the bed sheets were wet. We called the front desk and they came to our room immediately. That is when our stay turned very sour... The lady who came to check it out apologized and said they had no open rooms, so they would change the sheets and left to gather them. While waiting, my husband stripped the bed to find the underneath of the comforter damp with yellow stains present. The plastic mattress cover was wet and everything had a strong urine odor. I phoned the front desk to make them understand they needed to DISINFECT the bed, not just change the sheets. She said she would come to our room. I asked them to smell the sheets, but they didn't, and, from that moment on, had all their conversations in their native tongue. They didn't disinfect the mattress. Just lightly wiped it with a dry towel and seemed to be put out that we wouldn't change the sheets ourselves. Mind you, it is now 11:35 pm, and our only option is to stay or pack up and go to another hotel. Fast forward to checking out.... the same woman who inspected our bed, is behind the desk and tells us that because she changed the sheets and we stayed, our visit is nonrefundable or discountable! We asked for corporate and suddenly a manager discounted our stay. We have stayed at Best Westerns in other cities.... This hotel should be dropped from the chain. It's in more of a no tell motel class. We intend to report this hotel to the local health department, as sleeping on a bed in that nasty a condition, is a definite health hazard. To the local BBB, AND to the Best Western Corporate Office. DO NOT STAY HERE! Room was large and comfortable. Very clean inside and out. Pool was nice, always clean and plenty of towels were available poolside. Choice of hot or cold breakfast was very good and well supplied. Location was convenient and close to shopping, restaurants and for us - family. Staff always greeted us with a smile and were very polite. Room key only worked once, every time had to have them redo it. Room smelled musty ,a/c unit loud, stains on wall, and pillow cases. Found empty pop bottle by night stand. Put us in wrong room with 2 queen beds, requested a king. We showed up at the BW at 11:30pm after leaving a horrible hotel experience. The hotel clerk at the BW was empathetic and worked quickly with us to get us settled into a room. The house keeping staff and pool was amazing. The Continental breakfast was a plus. I highly recommend the BW in St Charles, Illinois. "EXCELLENT HOME AWAY FROM HOME"
Just returned from a 3 day stay in St. Charles and at wonderful stay at this hotel. We had a lovely room.....2 queen beds (most comfortable, with 4 luxury pillows and soft smooth sheets. The room was in the Executive building and was so quiet that we never heard any of the other guests. Our parking spot was right outside the door and we were on the ground floor. A full breakfast was provided. This was one of the best hotel we have stayed in. Thank you for our lovely stay!!!!!!!!!! Room was clean, and the outdoor pool was a refreshing bonus. The staff was friendly and accommodating. I would stay here again the next time I am passing through St Charles. I was happy to see some healthy options at breakfast. "Best Wester, St. Charles, Il." We stayed at this Best Western while visiting our children. The pool, and room were very clean and comfortable. Our breakfast was very food, and the pool was wonderful to swim in with my grandson. We had a lovely stay. "Great place to stay the night." Staff was very helpful, price was right, breakfast food was excellent, room was clean & quiet.I stayed here 2 nights this trip. I checked out in AM but forgot some drinks in the refrigerator & went back at 2:30pm, staff was very helpful & had my drinks for me. There were some stains on the chair & foot stool but staff said they shampooed them was the reason for this. The breathable air quality could be improved some, maybe a new air filter, rate 8 out of 10 for this (I have many allergies). But over all I like it here & I consider myself a picky person. I have stayed here 3 or 4 years in a row now. Denni L Thank you for taking the time to place a review on Tripadvisor. We deep clean our rooms constantly. See you soon. "Disappointed with the Customer Service at this Location"
First of all, when I arrived at this hotel, I was NOT greeted in Best Western style. The man behind the desk just glared and scowled at me. I told him I had a reservation and he processed it; however, he wasn't the least bit pleasant, nor did he say have a good stay or anything. Thus, my first experience was a negative one and it impacted the visit. I will outline both the pros and cons for you. Pros: The room was clean and the beds were comfortable. No real complaints with the quality of the accommodation. Cons: Our neighbouring guests were very noisy and you could hear everything. The fridge in the room had been turned off, so it was warm. My husband had to turn it on. My husband lost $1.00 in a vending machine. He asked for it back. Their solution was to give him a bag of chips and .40 cents. It made my husband feel like a crook. The breakfast was not up to par....bacon literally drenched and soaking in grease and sausage patties very greasy, too. Found an eggshell in the scrambled eggs. When I checked out, I was asked to sign another piece of paper....not even sure why. Never had to do this at another Best Western. I usually just hand in the key cards and leave. Would I go back here? Not unless every other hotel in the area was booked. It says it is operated by Pranham hospitality or something like that. Well, I hate to tell them that they need a Best Western refresher on the hospitality part. Thank you for the review. We will look into this. I was told that this would be a non smoking room. The moment we opened the door the disgusting smell of cigarettes hit us in the face. The pictures on the website were much nicer than the room we rented. We needed a "one night" sleep over place for a business meeting the next day. Best Western had a "special one night rate" that made them our choice. It was clean, comfortable, good location, and easy access. Glad you liked our hotel. See you soon! Our Executive building is most popular with the large rooms. I see you reserved one of those. Our outdoor pool opens in May. Decent night stay, decent price, clean. Came in for a concert at the Arcada. Hotel is close to the show and close to some pizza places. Have stayed in nicer places but this is good for the price. Doors go to the parking lot. Door keys died twice but they got them fixed. Breakfast was a hot breakfast but I did not try it. Thank you for placing a review on Tripadvisor. Our Fitness Center is renovated. We offer full hot breakfast. Our Outdoor Pool will have new pool furniture this summer. "Best Western in St Charles"
We were in St Charles for the All Canada Fishing and Hunting Sport Show. We stayed for five days. The location is close to Pheasant Run where the show was located. Smaller hotel with all of the amenities. Breakfast is included. Very quiet atmosphere. Full Hot Breakfast is served from 6am-10am daily. I am glad you enjoyed your stay with us. See you soon. We were given a smoking room which was disgusting. It was like sleeping in an astray. On the first night I asked to be moved and they claimed only a manager could do it, but refused to call one when I asked. The next morning I tried to get moved again and they claimed they were sold out, which was a lie because when my boyfriend went down and threatened to make sure everyone knew how disgusting the room was and unaccommodating the staff was, they miraculously found us a non-smoking room. Very disappointing service! This is a great property! We had a king bed room which was located on the ground floor of what appeared to be a newer two-story building. The room was clean and it was quiet even though we faced the parking lot. It had a fridge and microwave and the WiFi signal was strong. It's within walking distance of a number of restaurants - one was right next door in fact. It's also about a mile from downtown St Charles and the river. Would I stay here again? You bet! "Clean hotel, kind staff "
We stayed here 1 night. We had booked 2 nights but had a change of plans, and the man at the front desk allowed us to check out and cancel the second night. The room was large and very clean, in fact the facilities appear new (at least recently remodeled). Very nice continental breakfast too. We would surely stay again. Thanks! web site states continental breakfast. they do offer hot items also. Outdoor entrances to rooms, noise filters in a lot. None from adjacent rooms. 2 floors, no elevator. Updated baths, normal hotel decor in room. Clean, beds okay, I would have liked firmer. Gps couldn't find address, used Colonial Cafe, next door and found it. "It's clean, very nice rooms. close to restaurants and shopping"
We go to St Charles every year for the festival of the vine. and always try to stay here, it's only a short drive to Geneva where the festival is held. and you can take a cab there and back and , they have an out door pool. The room was clean but not what I had expected from this chain of Hotels. We had a great stay but it was as well maintained as I had hoped. The staff were not great at English and it was difficult to explain our needs at times. It was a rundown type of location. I was disappointed and will not stay there again unless it's a necessity. I didn't feel like we got our money's worth out of this hotel. I didn't feel as safe as I'd like in this type of accommodations. Well located in St Charles, very clean and large room with super comfy beds and bedding. Good parking, felt safe. Quiet rooms even though off major street. We were able to have our dog, as we were attending the local dog show. There is an extra fee though. Wifi worked well, not slow. I would stay again. Thank you so much for staying at our property in St Charles. 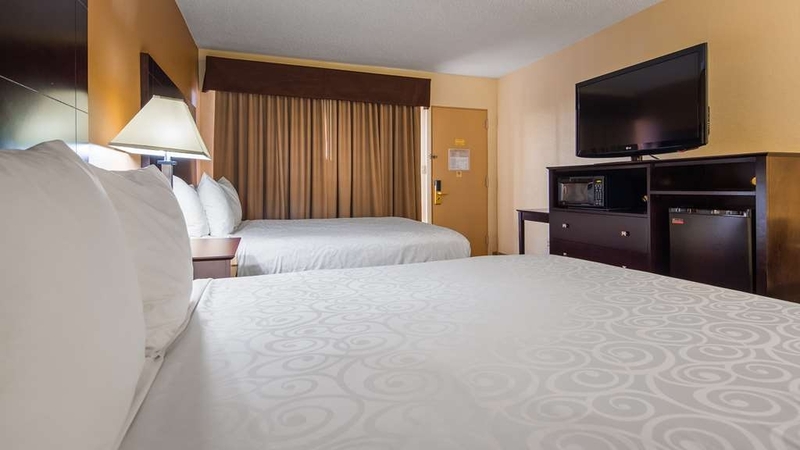 We appreciate all that you have said in regards to our comfortable bed and the hard work our housekeeping staff put forth to ensure the cleanliness of your room. I hope that the dog show went well for you. We pride ourselves in our customer service and I am very glad that you were able to make use of our free WiFi service. Please, if you ever find yourself in the St Charles area please consider us for your lodging needs. Great room, quiet, comfortable, great price. Staff was very helpful, check in and check out process went quickly. Would recommend the facility to anyone visiting the area needing accommodations. The facility is in the center of St. Charles and close to numerous restaurants and shopping. 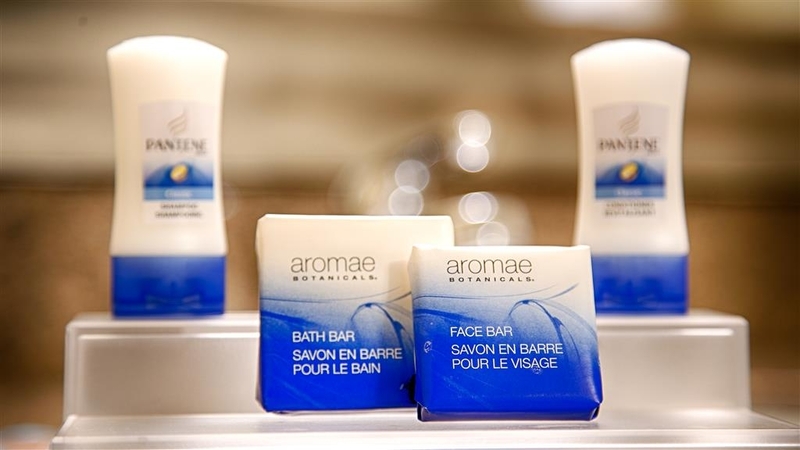 "Close to Arcada theater, downtown St. Charles, Geneva"
Excellent stay, front desk manager very accommodating as we got there early and he offered us coffee and got our room ready earlier. Colonial cafe next door good place for breakfast (if not eating at hotel). Also, close to theater. Another good place to eat McNally's up the street. Geneva another close town to visit - great stores and restaurants. "Bets bang for your Buck"
I have stayed at several hotels in the Chicago area recently and by far for a place to sleep this was a hit in my book. The breakfast bar needs to be attended to a little more. They need to try some of the food that they are putting out on the bar and then they would understand what I am saying. My room was clean and everything worked in it. :-) I would stay here again if the need arises. Just a lot further from work was a issue. "Best Western is my first choice in Hotels. Never a bad experience." CLEAN, friendly, kind, professional. I try to always stay at Best Western's for the reasons shown above. Always have experienced nothing but the Best from Best Western. Staff was great at giving us information regarding the area and things we could do to entertain ourselves. "Great staff - but facility is a surprise"
We booked because the photos showed a hotel, but this is a motel with the room doors opening to the parking lot. We were assigned a smoking room, which did not work for us. Despite having a pre-paid reservation, the staff was gracious and refunded our money. If you are okay with a motel-style facility, the staff here is terrific. Older,yet very well maintained motel. Manager a front desk very nice and friendly. I liked room had refrigerator, larger than most flat screen tv. Internet worked well. Breakfast in am was decent, Every was very clean in this motel.All in all a decent place to stay at a very reasonable price. I would definitely stay here again if I am in the area. Best Western St. Charles was very clean and well managed. Room was spacious well appointed for a mid priced hotel. Overall a wonderful value. Breakfast was included and offered decent variety and was fresh. Hotel neighbors were quiet. Location very convenient. Would return. "As affordable and nice as the area offers!" I find the Chicago area obnoxiously crowded, busy, expensive. This motel was a welcome surprise, with a great restaurant right next door, The Colonial. The staff at the Best Western was competent, helpful, friendly, professional. The room was affordable, large enough, well furnished (and everything worked well), clean, effectively refurbished. Air quality was good and the bed was very comfortable. Quiet room, too! No complaints. Was disappointed that if my dog had come we would have been placed in a Smoking room, however. Clean room with functioning ac. 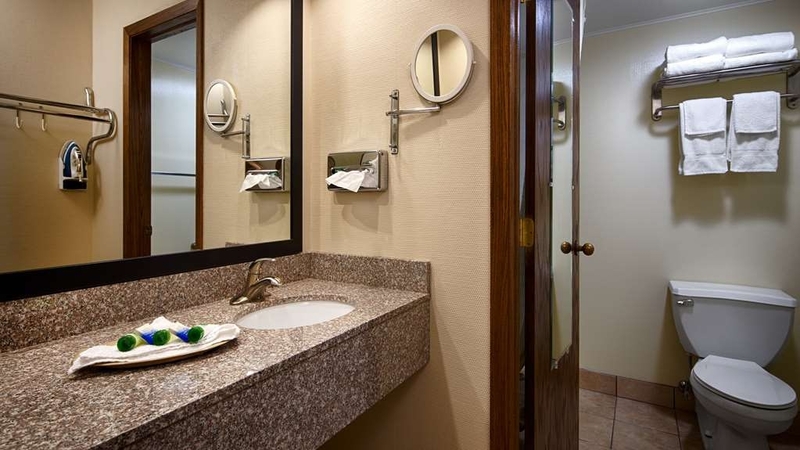 Nice updated bathrooms but bedding was thrifty and interior rooms need to be updated. Convenient location. Part of hotel is still a motel and the other part that's is enclosed the exterior door are not locked so anyone could come in. The room was clean, very friendly service, very accommodating staff both morning and night. The pool was clean and heated. Breakfast was okay. The hotel could use a larger eating area and maybe some benches/chairs outside as it was a beautiful weekend, but all in all we would consider staying here again when in town. First of all.... this is a "Motel" not a hotel. Rooms are accessed from the parking lot. The products used to freshen-up the room was disgustingly overbearing. The "breakfast included" was a joke. There was capacity for around 6 people. I had no intentions of eating there. The price of the room $99.00 (tax incl.) was a complete ripoff. This is not your typical Best Western Hotel. The room was clean and modern, the staff was very helpful, and they have a cute little pool. And don't miss the breakfast, it will be more than you'd expect! We will return next time we come for a visit. I have stayed at this property several times over the last few years. My complaint has always been the property was outdated by about 10-15 years. I stay because the location is exactly where I want to be. They now serve a hot breakfast and have upgraded the exercise equipment. I believe the rooms are going through a rework as well. I only stay in the executive building because I enjoy more space than a standard room and usually stay a few days. I expect to book this hotel again in the spring and look forward to additional upgrades. "Cute, quaint little hotel in St. Charles!" Nicely maintained smaller BW hotel in historic St. Charles, IL. Offers 2 (2story) buildings: one like "Motel" drive up parking and another with interior entry rooms. Nicely maintained, updated rooms. Good breakfast, but small seating area. Small pool for a quick refreshing dip! Exercise Room. Lots of shopping, restaurants and activities in the area around the Fox River. Pretty area! A clean spacious room for a reasonable price. Quick service when my room key did not work. Swimming pool very clean and welcoming. Hotel breakfast adequate. Colonial Café restaurant next door - walking distance, no street crossings - was great! Parking a little tight, but everybody got in. "The rooms were clean and the bed was comfy!" The room was clean and the AC worked well. We arrived mid-afternoon so we had time to go to the pool. The staff was very nice and the breakfast was great! There were many options to choose from and I loved the coffee machine. I used their desktop computer in the lobby to catch up on emails and chatted with the owner. It was a very nice two day stay for me. Great little hotel. Very clean room. Wonderful free breakfast, great variety, cooked fresh from real ingredients. Friendly and helpful staff. The room and the bed were comfortable. Convenient to anyplace in Saint Charles. "Great value! great staff! Clean and comfortable room!" The staff are very helpful and customer friendly. The hotel room was very clean and comfortable. The breakfast was a good choice of items, all very tasty. the location was very convenient to downtown and the convention center and local restaurants. "Best Western - St. Charles, IL"
We stayed at this Best Western for 9 nights at the end of May while we were waiting for our Grandson to be born. We originally had only booked for 5 nights, but had to add an additional 4 nights because our Grandson wasn't quite ready to come out yet! We travel all the time, and this property had one of the BEST breakfast buffets we have ever had! Property is going through some renovations, but other than that, our stay was perfect!!! I generally have much better service at Best Western than what I was treated here. the owner was initially condescending and refused the discount I should have received as a member of Best Western. I could smell smoke and the lights weren't blacked out by the shades that other Best Westerns usually have. overall, this is the worst Best Western I've been to, and it was because of staff. good breakfast, very clean, great Internet, very convenient location. "In town for medical procedure"
Very nice hotel - staff very accommodating. Will definitely stay here again if the need arises. The room we staying in smelled nice and fresh and the bathroom had recently been updated. The beds were comfortable too. Booked a room last minute for the night after an out of town wedding we were attending. Average hotel. Clean and comfortable, but old and in need of updates. Staff were extremely friendly and helpful. Nice breakfast options to grab something quick before checking out. 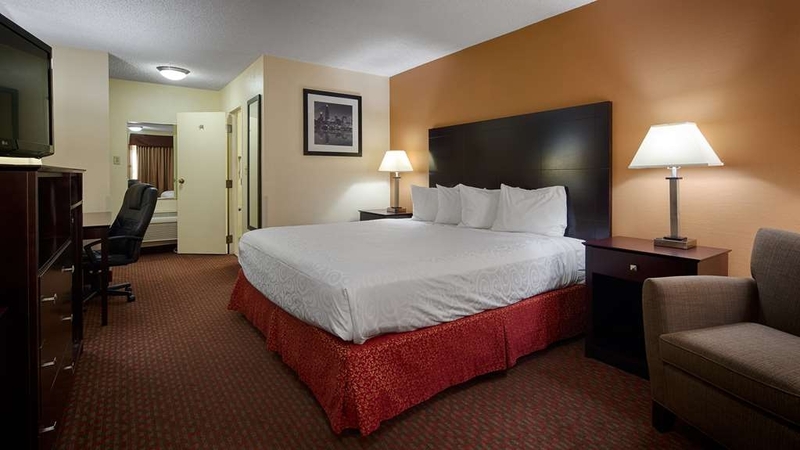 "Had very nice large room in back building"
Everything was clean, comfortable and convenient plus staff was courteous and helpful. Did not use free breakfast in hotel but plenty of restaurants and shopping close by within walking distance. Easy access and good parking as well. "This level of service normally twice as much cost." We were checked in by Kushni (spell?) with a great big smile and check in took about three minutes-when my wife could not figure out how to use the wifi she walked her thru the steps with patience and grace. The property competes with a very clean city and raises the notch a bar. You have the feeling that if you were about to drop a candy bar wrapper on the grounds someone from housekeeping would be there to catch it before it hit the ground. "Not bad for a quick stay and a deal"
Three of us stayed here Memorial Day weekend for a wedding. I booked online and got a good rate on a large room. The room was very clean. The bed was kind of average and the pillows were big and kind of hard. As others have stated, the bathroom needs an upgrade. The TV was huge. Easily a lot larger than in other hotels I've stayed in. The wifi was free, which is always nice. The hotel is conveniently located and was easy to find. The staff was friendly and very helpful. We got a nice roll-away bed for my kid and the room was large enough to easily accommodate it. So, overall, it's not great, but it's not so bad if you get a good deal on it. I wouldn't pay more than $125/night to stay there, but by booking through a travel site I didn't pay anything near that anyway! Great room, great breakfast, very clean and quite, very nice owners. I would highly recommend this hotel and would come back. Of all of the hotels in the area this is by far the best hotel. The owners take great price in the condition and services provided at this hotel. It is close to all of the attractions in the area. "Pleasant and friendly hotel, but needs an upgrade in 2 fields." We stayed in the hotel as part of a business trip for my wife. 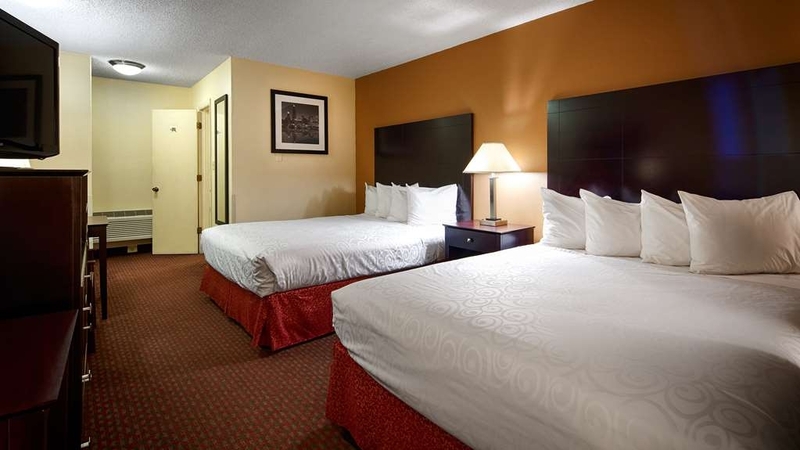 It is a motel type of place which also has executive rooms, that are really big. The room is comfortable (nice spacious bed, aircon, huge tv, lots of space), although it's quite outdated: there's a dusty smell to the room and the bathroom could use an update. The breakfast in this hotel was not so good: plastic cutlery and lots of unhealthy stuff (waffles, cookies, sugary non-fat yoghurt). So it was a pleasant stay, but not more than that. The location of this hotel was very convenient for us. Per previous reviewers' recommendations, we requested a room in the "executive building" and on the first floor since there is no elevator. The carpeting and bedding in our room appeared new. The heater was working well, which was a blessing since we visited on a cool weekend. No matter where your room is located, you have to go outside to get to the lobby and breakfast room. The breakfast had a good variety of hot and cold items, but it is a very small area. I had to ask a gentleman who was sitting at a table in front of the juice machine to pour me a glass of juice. The exercise room and equipment was great - very clean and looked new. The employees were all very nice. WiFi was kind of slow. Per previous reviewers' recommendations, we requested a room in the "executive building". The room was nice with new carpeting and bedding. The heater and television worked well. The breakfast was good and plentiful, but they could use a larger space. A gentleman was sitting at a table in front of the juice machine, so I had to ask him if he would get me some juice. No matter where your room is located, you have to walk outside to get to the lobby and the breakfast area. The location of the hotel was very convenient for us. The fitness room and equipment was in excellent condition. "A night away from home"
This is a decent hotel. They are currently renovating. When we got our room it was two queen beds and I specifically asked for a king. I went back to the desk and they were able to switch us to a king room. The room was clean, updated. No comforter on the bed just two sheets and a blanket (could use a comforter when temperature is still cool out). Everything worked properly (lights, tv, hair dryer -- although if dryer gets to hot from being on to long it does shut off temporarily). There was no bars in the shower area, could use one. The full breakfast was really good and yes they could use more seating area or you can take it to your room! Night person at desk not as friendly as morning person (don't remember names). I would stay again. 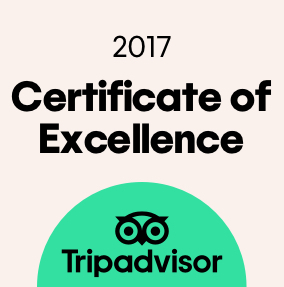 "Great experience and excellent room." Just returned home from a stay at Best Western Inn, St Charles. Check-in was very smooth and the lady at the front desk was very nice. We did have several request and those were promptly addressed and handled very professionally. The room exceeded my expectations...very clean, recently remodeled, great bed, clean bathroom...very nice indeed. New LG flat screen TV and great internet service. Lynn and I are looking forward to our next visit. Thank you for a very pleasant stay. Stayed here two times in the last two years and will likely return. Rooms are big, kept very clean daily and the breakfast ain't bad. Many shops and restaurants close by and not too far from the Metro train to downtown Chicago. Staff has always been friendly and helpful. This trip's sleep was interrupted twice by some early morning noise; probably mechanical. Also, wifi a little weak, but this room was in the back portion of the hotel. Overall, good place, good folks. "Very nice stay for the money"
Came to St. Charles, IL for a family visit and was very glad with the condition of this hotel. Nice quiet hotel in great area. Wonderful hot breakfast with lots of variety and selections. Clean rooms with very comfy beds. Good selection of TV channels and easy working internet for my family to use. We had a first floor room with parking right outside our door which makes it very easy and accessible. "Last minute room request granted"
Lived the staff and the customer service provided by finding a way to get a room at late part of night, after midnight. The front desk employee was able to book a room after a cancelation and was very happy to help complete check in service much faster than usual because of lateness of check in and was able to make the stay seem like no time was lost versus if we were to check in at normal say check in time and have the full day to pay for and enjoy our stay! Thanks again. "Exceptional quality, service, and value "
We had two rooms for Easter weekend, with grandkids in tow. They put us close together, and respected our privacy. ..of course, they were all but happy to help when asked. We are appreciative of all the remodeling they have undergone. It looks marvelous, and is spotlessly maintained. We even used the exercise room this time! We'll keep coming back! Check-in was cold and very impersonal. Neither person behind the desk was dressed professionally. And most aggravating of all was that two of the owners were loudly arguing in a foreign language while guests were trying to eat breakfast. It was very disturbing. Plus, hotel workers were eating in the breakfast area where there was hardly enough room for guests. Terrible experience and unusual for a Best Western. Also, the outside doors not locked at night. "Great place to stay. " Great rooms, clean, excellent breakfast, excellent customer service. We had a large party stay there this past weekend for a family event. When we are back in town will most definitely stay there. The only negative thing would be the loud conversations by the cleaning staff in the hallway early in the morning. We had such a great experience at the Best Western Inn of St. Charles! After booking this trip on Expedia and accidentally requesting a smoking room, we got to the hotel and Mr. Patel was able to upgrade us to a non-smoking whirlpool room at a very good price! The customer service was atypical and definitely appreciated. Plus, the location was easy to find, great parking, and the restaurant next door was perfect for our late night ice cream craving! We would absolutely stay here again! 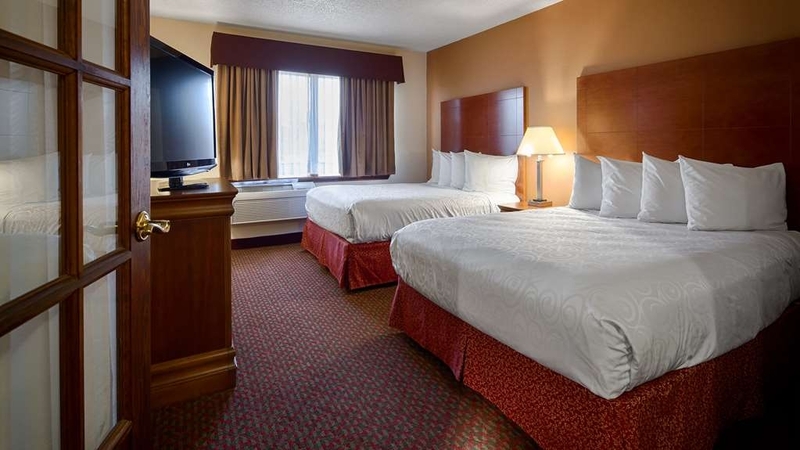 "Our Go To Hotel in St. Charles IL." We have used this Best Western Hotel many times over the past 12 years. We have always been satisfied. We were pleasantly surprised with our last stay that there had been some redecorating to the rooms, and upgrades to the breakfast. The hot offerings for breakfast were an especially nice addition. The only negative, and it's a small one, is that the lobby/breakfast area is a bit small. We have always been pleased with the cleanliness and comfort of the rooms and helpfulness of the staff. We will stay here again. Older motel in need of renovation. We saw a dozen or so ants in bathroom. Staff was friendly. Motel was in convenient location. Not up to the same quality as other Best Westerns that I have stayed with. Came here for a night out in Geneva. Got an exterior room. Was somewhat musty smelling. I found one of those old "cone" shaped air fresheners hidden in the closet in an attempt to cover it up. Aside from that the rooms were properly cleaned. Breakfast was more than expected and well stocked. If it weren't for the smell of the room, my review would be much better. My wife and I go to concerts at the Arcada Theater, which is only about a mile down the road from this facility, a few times every year. We always sty here, because we know the place is spotlessly clean (newly remodeled, too), and the staff is very accommodating. They feature a great, REAL breakfast, as well! You can't find a better place in the area for this price. Four stars in my book! "Christmas in January with family and friends"
We love this Best Western! After having a complete knee surgery before Christmas I was so looking forward to this trip. We found our favorite room had been beautifully updated and was so warm and cozy. I needed some quiet time and this was perfect! The owner and staff were excellent to our every need and couldn't be any better. The continental breakfast has also reached another level ,which was fantastic! We will return again and again as our number one choice to stay. no complaints. it has a bed, a shower, a fairly large room. included is a modest breakfast. the price is right. nothing special but it is more than enough for a nice stay here. couldn't find anything negative to say about this place. "Nice clean and comfortable hotel"
This hotel is our home away from home at least three or four times per year. The room is always clean and comfortable. They have a nice breakfast ( including hot items). The staff is helpful. 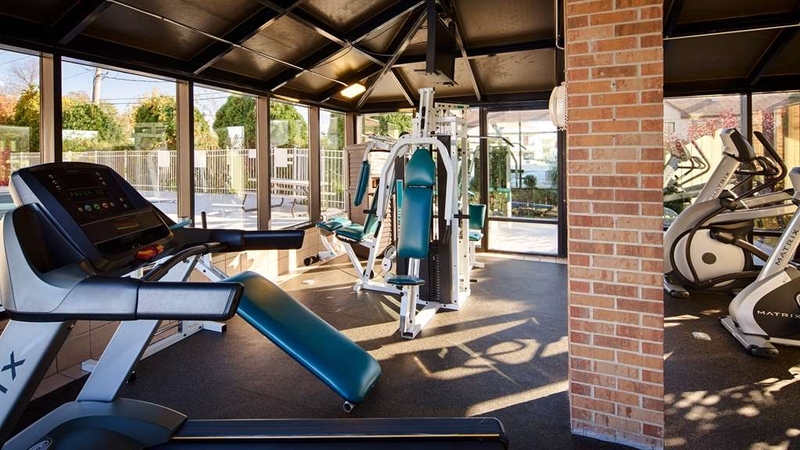 there is a fitness room and a washer and dryer available for guests to use. 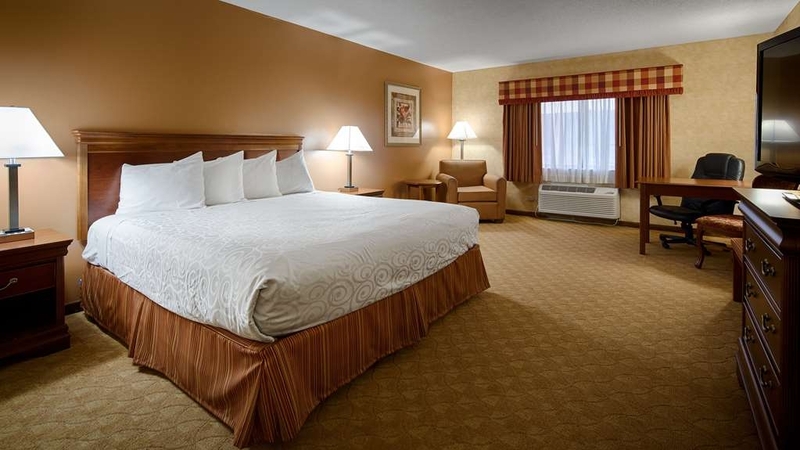 It is a convenient hotel as it is close to historic downtown St. Charles, Illinois. We highly recommend this hotel. Horrible place to stay. Their newly remodeled side was so outdated. The king jacuzzi was a cheap hotel style even by standards 20 yrs ago. I can't believe they're AAA rated. The tub was full of mold and crud (have pictures to prove it) due to poorly cleaned jets even after I ran a sanitizing tablet. Yuk. The free breakfast was nasty, orange flavored water for juice, fake syrup, not sure if the eggs were real and the coffee machine coffee was just colored water. Never will I ever go to ANY best western because of this place. The only reason I gave a one star rating was for the lady that was at the counter who was so sweet ( but was unable to make any decision without calling the manager)...too bad. "A very different motel, depending on what section you stay in"
We've stayed at this motel twice. The first time, we stayed in the section right next to the office - where the room entrances lead directly to the outside, like an old-school motel. Those rooms were extremely average, bare bones, no frills, not that great. Fridge and microwave was nice. TV options very limited. But the bed was comfy. OK - the second time we stayed in the new section which is a brick building right next to the pool. COMPLETELY different experience. The room was much nicer and newer. Very quiet. No outdoor exposure entering and exiting the room. The room was much bigger and the bathroom much nicer. Very surprised they charged us exactly the same fee for both rooms. The pool is outdoors, so wasn't in season to try that out. Nice location - close to downtown St Charles. I had stayed at this property a few years ago and it was getting a little tired. I usually stay a two different hotels nearby, but both were full for this trip. I received a room in the South Building when I checked in, and I was not expecting much to be honest. The building and rooms appeared to be completely renovated and everything was very nice and clean. I was not disappointed with my stay! "Ask for a Room in the New Updated Section!!" We have stayed at this property once before. We got a room in the newly remodeled back section. The rooms are big & spacious...much less noise and light than the rooms in the older section. Its just nicer in that back section. We recieved a room on the second level of the old section. Too much light..too much noise. You didn1`t hear nothing tucked in that back section. Rooms are much nicer back there. All I can say is WOW! Best westeen has stepped it up!! Very impressed, had an awesome time at the hotel and in the shopping area!!!! There is so much to do in this beautiful town...great food, people...shopping!!! Had an absolute awesome time! Be very careful during booking; was placed in smoking room first night and this was not identified when booking through Best Western website. Next day I requested a room change, hotel checkin clerk did not have the authority to do this and had to contact the manager/owner to get approval first. The room was attractive, clean and spacious. The breakfast was excellent. Staff needs to tell guest of the additional seating in the basement for the overflow. Staff allowed guest to stand to eat without telling them of the extra room downstairs until after the fact. This hotel is close to everything and keeps improving with each stay. They are constantly do improvements. This time our beds were brand new and so comfortable! Same with sheets and bedding. There is a free breakfast of waffles or pancakes. By nice people. Next door is the Colonial for meals. The room was a good size. Decor was up to date. The room was very clean and neat so I was very happy. There was lots of storage/places to put our stuff in the room. My only complaints was regarding the useless hair dryer and also the water pressure in shower was very low. Room was very clean, with the exception of a fair amount of dust on the tables...I assume it hadn't been rented out in awhile. The building is quite old and could really use an update. Despite this, it seems to be in good repair and well-maintained. "Our stay at Best Western St Charles"
We stayed at this hotel last year and again this week. Pleasant and courteous staff. Clean room and bathroom was updated. Very quiet. Continental breakfast was average. 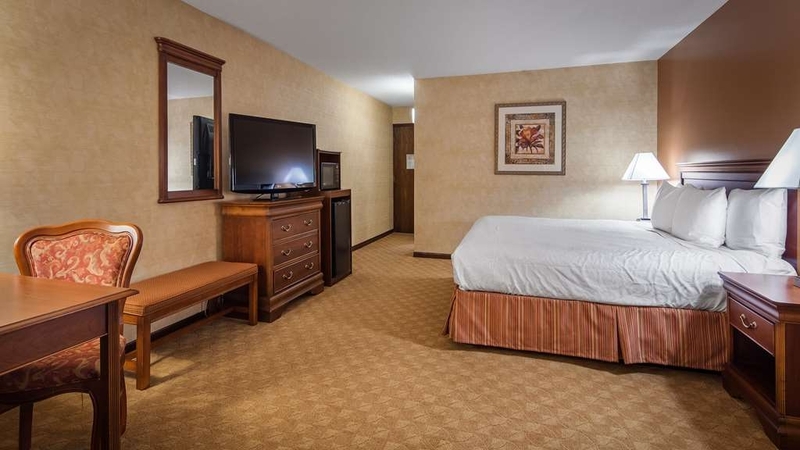 Not a luxury hotel but reasonably priced and close to downtown St Charles. The Best Western Inn St. Charles is a Nice Hotel for the Price, you cannot find too many hotels for under $100 these days so we gave it a shot. The check in desk area was very nice looking, the young man that checked me inn looked very presentable, he was even wearing a tie which I thought was a nice touch, we got our keys and headed to our room which all have doors to the outside like an old style Inn. The outside stairwells were not too clean, we got to our room and opened the door. The bed did not have a comforter on it which was a little strange, then I set my stuff down and sat on the bed, It was VERY hard. 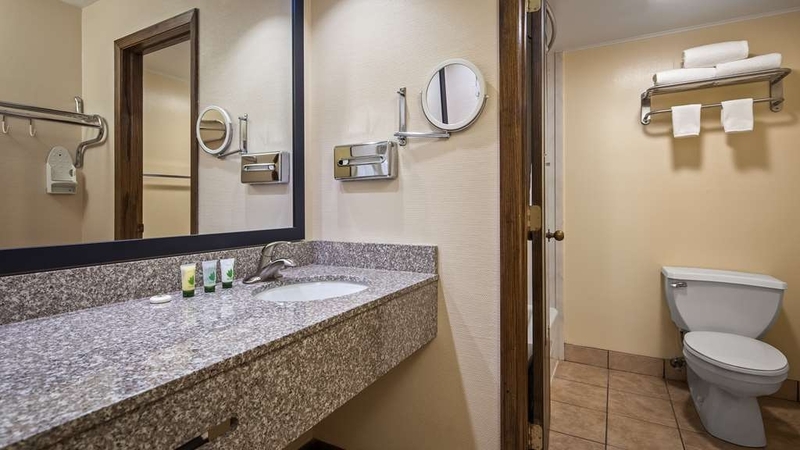 The rest of the room was clean, nice big flat screen and the bathroom looked like brand new with nice up to date tile and faucets, and the shower the next morning was wonderful so much water pressure! Over all not a bad room just the bed was uncomfortable. 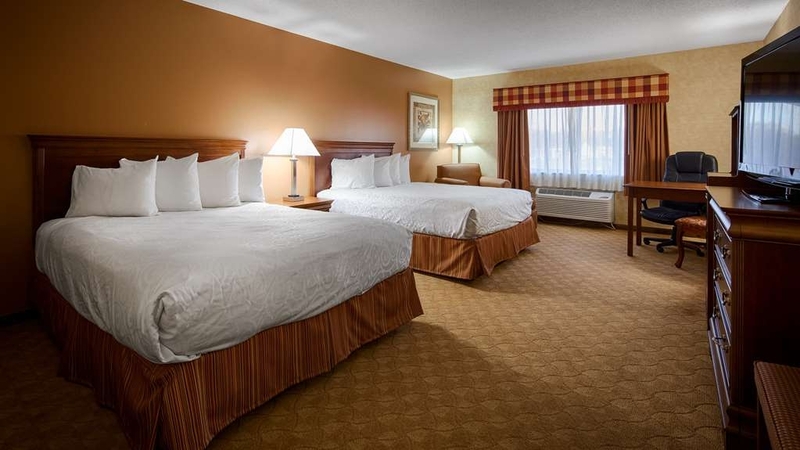 "Best Western in St. Charles, IL"
The facility was clean. The room was spacious. I loved the bed. This hotel is right on the highway which makes it accessible. It is very close to the various businesses in St. Charles which is a nice city to visit. no welcome. I felt like I was interrupting the office employee. no conversation. First room was in the original building. horrible smell. no ventalation. the smell was 40 years stale and made me sick within 5 minutes. I was able to change rooms. That room was very nice. looked like it was newly built. Check in was very quick and when we got to our room, the beds had updated coverings and I had a very comfortable sleep. Wifi was excellent, Amenties in the bathroom were excellent. We had a very large screen updated model TV with lots of channels. 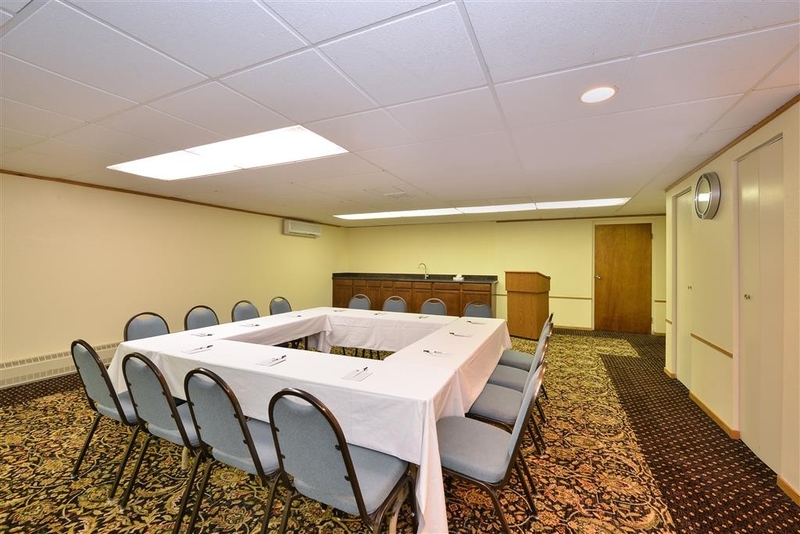 Hotel is in a great location, just a mile from downtown St. Charles. We would stay here again in a heartbeat. Didn't partake in their daily breakfast, it was late when we checked out. There is a wonderful restaurant, Colonial House, which you can walk to.